Classic Craft S&S 25· R.O.R.C. The great Germán Frers, father and grand father of the two known designers of nowadays, had a brilliant career in Argentina, where he was born, and many of his designs were built in more than one unit. 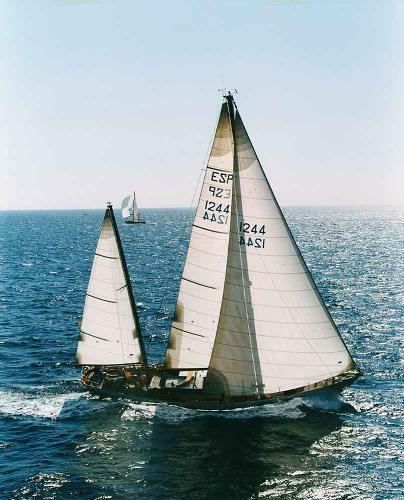 The Escorpión is quite a sister ship of the Horizonte, that Germán Frers had built for his own use. Both these vessels sparkled the fame of their designer, the first with a circumnavigation and the second with a two Atlantic crossings and a racing career full of victories that is still going on in the classic regattas. Mr. Adolfo Züberbuler asked Germán Frers to design the Huaglen and had her built at the Gómez y Gutiérrez Yard, the usual Yard were the designer built his boats and that he even partially owned. She was launched in 1943, a year after her sister ship. To build her local woods were used: the Lapacho, a heavy specific weight wood, for the keel, stemhead and sternpost. The Viraró, lighter and more flexible, very resistant to wet, for planking. Frers gave to the boat a centre board, very fashionable ever in American boats, with broad lines aft and with a marked fixed keel that houses the canting one. Thus, this is invisible below decks. A few years after her launch, the Huaglen changed ownership and was purchased by Mr. Carlos Baradaco and had her name changed to Ploush. 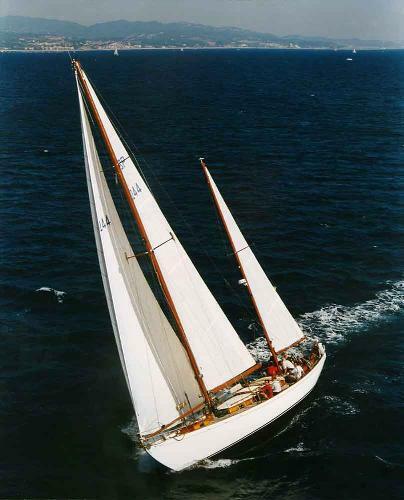 With her Mr. Baradaco crossed the Atlantic and found her home port in Palma de Mallorca where the Ploush entered many races every year until 1963. Due to illness, Mr. Baradaco then sold her to Mr. José Luis Pérez Albert who named her Carolus II. With the Carolus II Mr. Pérez Albert entered many races too and, being a fast boat, she won important prices, as the Mediterranean Champioship in 1964, a fact remembered by a plaque in the central companion-way. This peculiar companion-way, starboard sided, was a typical feature of blue water vessels since old. In fact in UK it was called “Ocean companion-way” and it's placed in the ideal position when the boat is sailing starboard side. The present owner of the boat, when young, met Mr. Pérez Albert and sailed in the Carolus II. In 1968 she changed hands again and Mr. José María Padró named her Escorpión. Mr. Padró was a passionate sailor either cruising and racing. In 1974 he founded the National Cruising Association (today Royal) and was its first President until 1984. It was then, when leaving the racing fields, he prepared the Escorpión for a worldwide cruise, that was then a more endeavouring accomplishment than it is nowadays, lacking as they were from any of the modern facilities along the way. Some of the trips were sailed together woth friends, as Jacinto and Nena Viladomíu who wrote an interesting book about their voyages, a book very difficult to find today. Her present owner purchased Escorpión in 1992 when she had returned from her circumnavigation. Since then, she has been cruising for pleasure in the Mediterranean Sea, up to Greece, and racing in the C.I.M. championship (then sponsored by Prada). 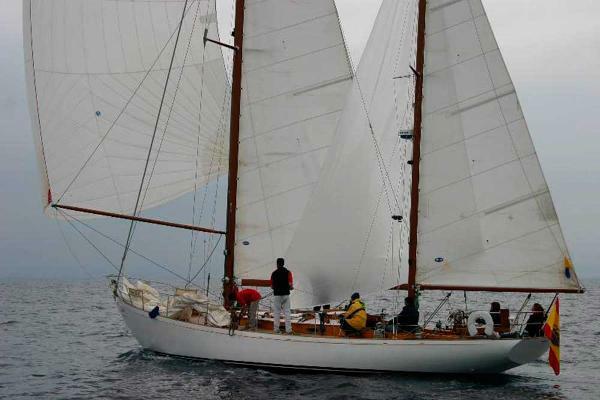 Ten years later, in 2002, the Escorpión crossed again the Atlantic to participate in the Antigua Classic Week. To do so, she received an amount of works and improvements that allowed her to even come back sailing without any issue. Today the Escorpión is in very good shape, ready to start for new cruises. She just need some aesthetic care. This boat is Lying not far from the Barcelona International Airport. You could flight there in the morning, visit the boat and come back home during the same day. You can contact us in Spanish, English, French or Italian.